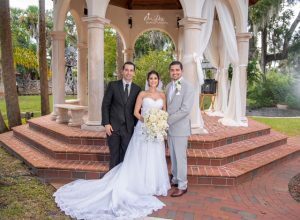 Surrounded by a beautiful scenery of natural Florida, Julio and Nicole became husband and wife at The Estate on the Halifax. Family and friends gathered by the gazebo to witness the union led by Harry Rubi of Sensational Ceremonies. I am a lucky man, if not the luckiest. I have loved Nicole with increasing degrees since the first time I saw her. I realized she was the perfect woman I had seen numerous times in my mind’s eye. The most admirable aspect of this wonderful woman is her mind. Intelligent thought is just scratching the surface. If we could dive into the complexities of her mind, you would find attributes like loyalty, dedication, compassion, kindness and much more. All of the aforementioned qualities are great assets on their own to any one person. My experiences with Nicole throughout the years have shown me she possesses all, and many more. I could have not asked for a more loyal partner, since loyalty is something I deeply admire and respect. This part of Nicole has been a been of great importance in our growing relationship, as I am sure will continue to be as a married couple. The dedication this woman holds is nothing short of extraordinary. Whether to a list of chores or working towards the improvement of our relationship, her dedication truly knows no bounds. Returning to how I started this explanation. Luck is not something I believe in, but my sense of understanding wants to put words to how I came to deserve her. If it was Karma, I must have done something incredibly good to deserve so her; I have not. Both aspects: luck and Karma cannot seem to explain why a woman like Nicole has agreed to become my wife; I am left with no understanding of how love works. All I can say for certainty is that I look forward to explore this as husband and wife. The good and the bad, the happy and the sad, or anything that comes our way. Sharing my life with Nicole will be my greatest privilege. Following the ceremony, Our Day Wedding Photography captured the beautiful scenery and their new marriage as they began to celebrate through the night. After a delicious dinner served by Puff ‘n Stuff, the true festivities began led by DJ Chelsea with Al Dee Productions. It was an amazing day of celebrating two becoming one in the sight of their closest family and friends. Congratulations to Julio and Nicole!